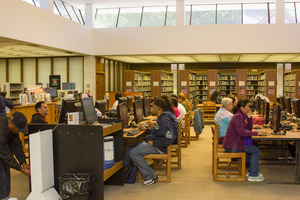 The library has over 30 public access computers available for use from 9 am - 8:45 pm Monday through Thursday, 9 am - 4:45 pm Friday. Once your library card has been activated for public computer use, you will be able to use a public computer by going to any available station. Type in your library card barcode number in the text box on the starting screen. That's it! If there are no available computers, ask our circulation staff to add you on a waitlist for the next available computer. We offer guest passes to patron who do not have a library card at hand. Our guest passes cost $2.00. Please ask our circulation staff for more information about guest passes. Your session starts with Two (2) Hour and will automatically be extended by 20 minute increments if there is no waiting list. Your session time maximum is eight (8) Hours per day. You cannot save or download to the computers themselves, so save your documents to an external drive, send to your e-mail or print. Remember to remove your USB drive and Log Off when closing your session. Please note: Charges and other restrictions may stop the use of your library card for computer use. Our courteous staff is available to assist you.